The area around Cooley Law School Stadium, home of the Lansing Lugnuts, has changed significantly since 2002. If you host an All-Star Game, there's no such thing as an All-Star break. 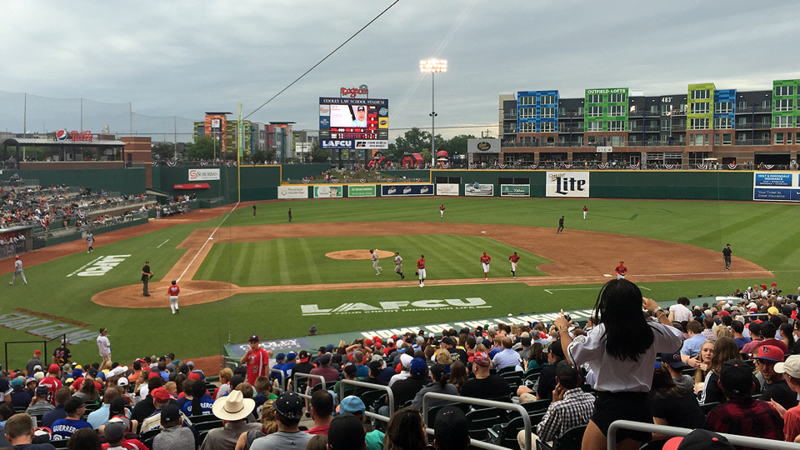 That was the case for the Lansing Lugnuts this year, as the Midwest League All-Star Game was staged at their home of Cooley Law School Stadium on June 19. This was one of five Minor League All-Star Games played that evening, with the Carolina, California, Southern and South Atlantic League showcases also taking place. The last time the Lugnuts, Class A affiliate of the Toronto Blue Jays, had hosted the Midwest League All-Star Game was in 2002. "One thing for us was being really driven to sell tickets, to get people here and really make this a celebration of downtown Lansing," said Lugnuts general manager Tyler Parsons, a Michigan native who began working for the team during the offseason. "The entire landscape of the city has changed since , a 16-year gap. ... I tell everyone that I grew up around here, and remember 15 years ago when there were about 100 residential apartments in walking distance from this ballpark. Today, there's about 1,500. It speaks volumes to how much this area has grown." The Outfield Ballpark Lofts, which loom dramatically above the playing field, are part of Lansing's current downtown resurgence. The 2016 addition of the lofts, in conjunction with a new videoboard and the expansion of the concourse to make it a full 360 degrees, have given new life to a stadium which first opened its doors in 1996. The All-Star Game, then, is not just a chance to showcase the league's top prospects. It also represents an opportunity to show off the host team's ballpark and overall operation. Executives and, of course, players from all 16 Midwest League teams were in attendance, with Parsons estimating that his staff made hotel arrangements for over 300 league-affiliated guests. The front office also planned pre- and post-game parties (the latter held after-hours at a downtown interactive science museum) and coordinated a meeting of the league's board of directors. "The last thing you want to do is bring your peers, who you respect the heck out of, to bring them to your stadium and have a dud of an All-Star Game," he said. "It's a credit to our staff. ... We broke [All-Star Game planning] down into different committees and then basically had a running spreadsheet where things were updated as we went along to make sure all the coordination was done. "You're getting guys here, getting their bags, getting the hotels all taken care of," he continued. "You know, we don't even get the rosters until about two weeks before the game hits, and then it's Minor League Baseball, so you know you're going to have replacement players and that kind of stuff. Really, it's just dealing with the hand you've been dealt. ... A lot of moving parts." One unique moving part on this Tuesday evening was comedic performer Domingo Ayala, who was on hand to sign autographs, coach first base, co-host the Home Run Derby and provide hitting advice. "Everybody brings in old retired MLB stars. We wanted to bring somebody that was a whole different direction," Parsons said. "Domingo Ayala is a baseball-centric personality and YouTube star. And, from talking to the players, we knew they'd have a connection to him as well." Ayala didn't compete in the pregame Home Run Derby, which was won by Ronaldo Hernandez of the Bowling Green Hot Rods. Hernandez's offensive prowess allegedly did $11,000 worth of damage to the Lugnuts' scoreboard, according to an invoice Parsons sent in the wake of the event. Hernandez's Eastern Division All-Stars emerged victorious in the All-Star Game itself, thanks to a two-out, two-strike game-winning 10th-inning single by Montrell Marshall. (Had Marshall made the third out instead, the game would have ended in a 2-2 tie.) It was a fittingly exhilarating end to an evening at the ballpark in which everything seemed to go more or less as planned. "Hey, Lansing's the cream of the crop," said Parsons. "We got to raise the bar up a little bit and let [2019 host] South Bend know what they've got to [aim] for next year."